My room is definitely a work still in progress, but I can finally say I am getting there. It took an entire day for my dad and I to move my room from one school to another. When my dad made my loft I told him he would never have to move it... he just moved it for the third time. I have tried to use everything I learned from Debbie Diller's Spaces and Places workshop. -I used the same color of fabric and border for all of my boards. -I placed my word wall beside my meeting area. -I did not put multiple alphabet or number sets up (one is enough). My pirate number set came from Made For 1st Grade. I also have a pirate set of rules and writing posters that go with the numbers. -I threw away stuff that I have not used in awhile and got rid of any furniture that was not functional or worth the space it took up. -I sorted and organized all of my things and put like stuff together and I labeled everything. Here is what it looks like now. I still need to create my CAFE board and Daily Five chart, label all of my book boxes (using Reagan's awesome Classroom Library unit), finish my traffic light, label my kid's cubbies, paint my loft and a couple of shelves, and cover the rest of my bulletin boards. Your classroom looks stonking. The only thing missing are the wee lasses and lads bringing life to the room. I hope you post a picture of the kiddies soon. So cute.Love your center signs and the pirate ship tube-you are very creative! Good job! 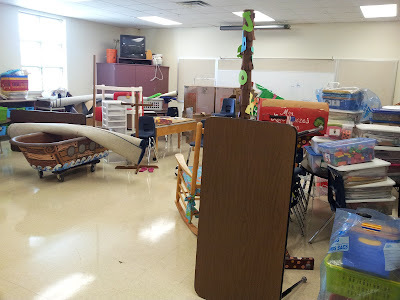 Even though it is a lot of work...I am sure you were having fun setting up a classroom again. Especially for kindergarten! Enjoy your year!!! OMG, your reading tub is probably the cutest thing I have every seen! Your room is adorable! I would love to learn there! Teacher Dads need a huge shout out! Where would we be without them? Love your room! 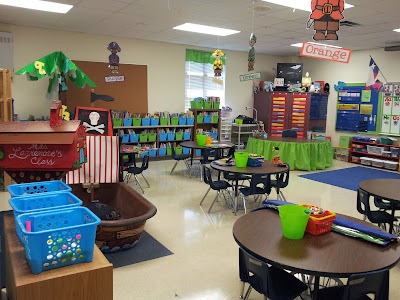 Your room looks fantatic:) I love your book bins! I bought Reagan's book bin labels tooand can't wait to get them on. Good Lord! I am in love with your Pirate themed color words, the loft, the tub/pirate ship....so fun!!! Wow! You have been BUSY! Your room looks fabulous! I LOVE your meeting area and the special touches like the pirate ship and loft make it SO appealing! You are such an inspiration! Thank you for the library shout out! I hope it goes quickly for you. Mine is not quite done!! Your room looks great! That ship/tub is fantastic!! Loving that you are back in a classroom!! Wow! You've really been busy! Your room is super cute. Mine, unfortunately, closely resembles your 1st picture. Moving was sprung on me at the last minute. I'm envious but happy for you. You've been very busy. I LOVE it. You should come link up to my before and after pictures linky. It's also a giveaway. Your room is looking so great! The word wall area is so well done and of course I love the loft and pirate ship! You and your dad must have been exhausted! So much done in a day! Thanks for the inspiration as I have a long way to go! 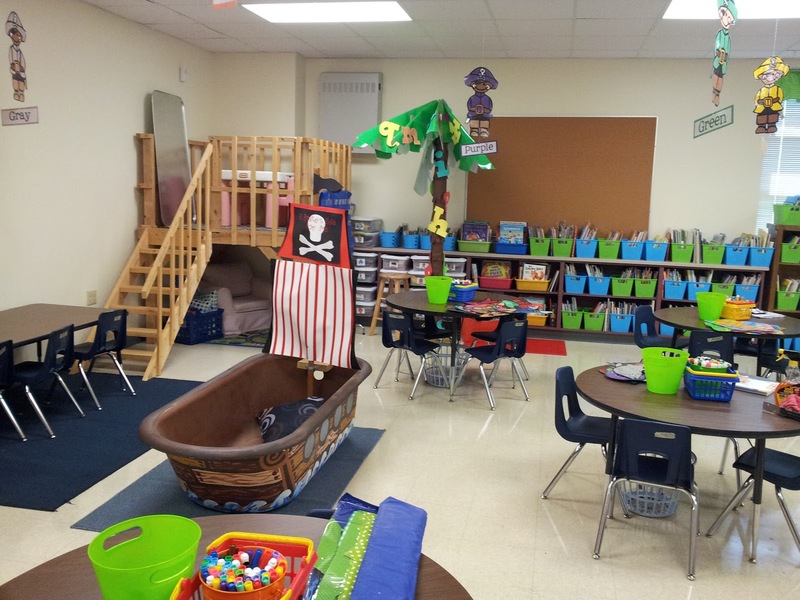 I love your pirate reading tub! So cute! Wow!! It looks FAN-tastic!! I love how your tub turned out--you did an amazing job on it. 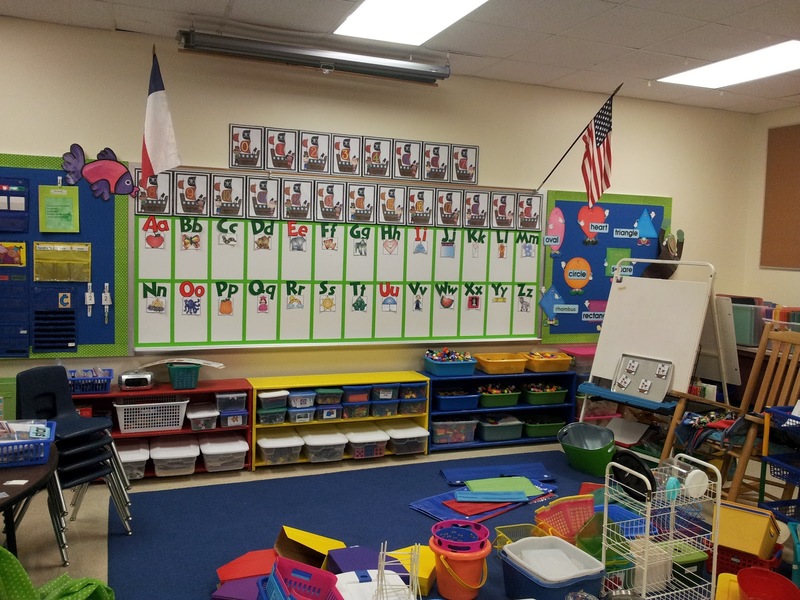 Your kids are going to be so excited when they see it--who wouldn't want to spend their days in that classroom :). Sadly, it makes me a little panicky--my 'task list' is not as bad as it was at this time last year---but that's because only 2/3 of my 'stuff' is in boxes (as opposed to ALL my stuff in boxes). Looks good! I really like the tub as a pirate ship!! Just curious, how do you move a loft like that? WOW! I love the loft- what a great idea!!! Soooooo cute April as always. Love the pirate stuff. What did you use to frame your word wall sections? Also, What is the trunk of your tree made from? Excellent job my friend!!! 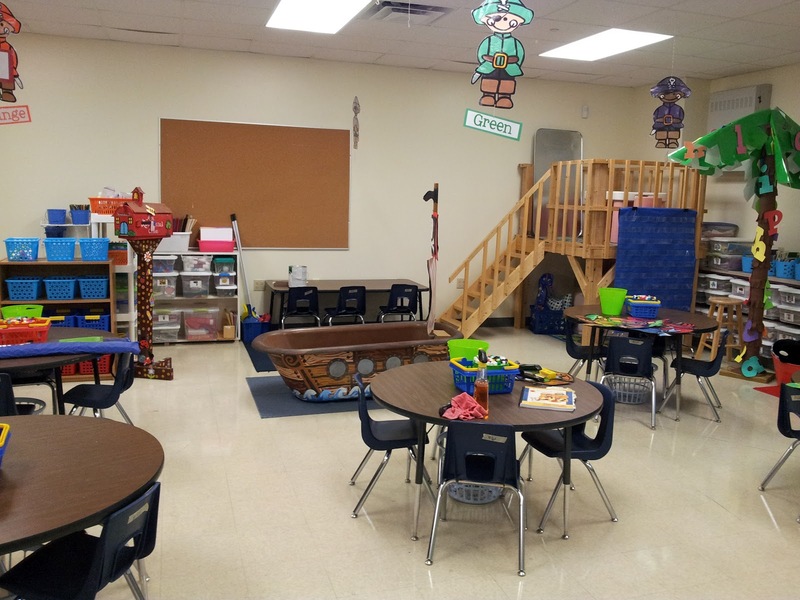 Lovely and HUGE classroom space! I LOVE your pirate boat made from the tub! So cool! I also love the loft that your dad built! I have wanted one like that for a while now, but it would never fir in my small classroom. I just love your classroom! I want one of those lofts!!! I'm in AWE of you (as usual)! You got so much done in a DAY! I'm so loving your loft and pirate ship. You're using my favorite colors too! Oh how I would love a reading loft. Would you share where you got yours? The reading tub is also exceptionally cute! Wow...you have just the most beautiful, big, calming room. (I've got 25 kinders stuffed into a small, small, room...really small). I love your color theme! Your room looks so neat and organized and I like how you store materials in your room! Amazing classroom! Where did you get your colored shelves under the word wall? And your alphabet letters on it? A friend of mine had her husband make the shelves for me :) They were so cheap and they have been the best addition to my classroom. The letters on the word wall are pre-packed bulletin board letters from Mardel the teacher store. They come in all shapes, sizes, and styles. Soooo cool!! Love the loft, wow. This will be my second year of pirate theme- can you please tell me WHERE you got that adorable pirate ship?! Is it a bathtub? Cardboard around a bathtub? Thank you so much. And thank you for being an awesome teacher! Beth- My friend gave me an old tub and another friend I have painted like a ship for me.